It was a case of back at Highbury and back on song as Dean Marney and Fleetwood's two Welsh wizards Wes Burns and Ched Evans fired them to a fine 3-0 victory over Coventry. 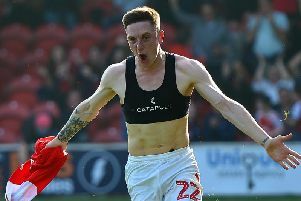 It was an end-to-end first half but as soon as Marney broke the deadlock in the 54th minute Fleetwood took control, Burns and Evans increasing the scoreline. Boss Joey Barton had urged his men to bounce back and they did in some style. Though it was a victory once again that owed a lot to keeper Alex Cairns. The shot-stopper did not deserve to concede at Home Park and was rewarded with a clean sheet at Highbury. Conor Chaplin blasting a spot-kick over with the score at 3-0 after James Husband was ruled to have tripped Jonson Clarke-Harris. It was not a faultless performance but certainly a message to the doubters as Town re-found their firepower with Evans, Burns, Marney and Cairns stealing the show. Barton made six changes from the side that lost 2-1 at Plymouth. Craig Morgan, James Husband, Dean Marney, Conor McAleny, Wes Burns and James Wallace all came into the side. Cian Bolger, Jason Holt, Ash Hunter, Nathan Sheron and Ross Wallace moved to the bench. Ryan Taylor was the other man that started at Home Park to be left out, the midfielder not included in the match day squad with Kyle Dempsey and Harrison Biggins also missing out as Ged Garner took up a spot on the bench. It was an end-to-end opening with ex-Fleetwood man Jordy Hiwula thundering the ball into ex-team mate Alex Cairns after dancing past Lewie Coyle. Ched Evans and Wes Burns fired over for Town with Burns also nodding the ball straight down Lee Burge's throat. Coventry's Conor Chaplin wasted a golden opportunity. Tom Bayliss was ruled to have been chopped down by Dean Marney just outside the box but Chaplin could only loft the ball into the Memorial Stand. Town were rescued by keeper Alex Cairns once again just before the half hour mark. Fresh off the back of numerous fine saves in the defeat at Home Park it was his left foot this time that kept Coventry at bay. Luke Thomas breezed past left-back Husband and pulled the ball back for Chaplin but his effort was just diverted away by the in-form keeper. Though the closest Fleetwood came was through a Coventry man. Madden threatened to tee McAleny up on the overlap but his ball was intercepted by Jack Grimmer. Grimmer's intervention sent the ball flying to the bottom corner but Burge dived to his left to tip it away. Coventry continued to threaten on the flanks and as they tried to stop them breaking Fleetwood defender Husband harshly found himself in the book. The full-back was cautioned for a foul on Thomas when he looked to have won the ball fairly. Though it was Town who ended the half strongly. Madden saw his angled strike just tipped away by Burge with the keeper on hand to just divert Lewie Coyle's thunderous effort away. Fleetwood started the second half strongly, Burns lighting up the right wing. He saw a spectacular effort from deep on the right clatter the woodwork before playing an instrumental role in nearly breaking the deadlock. His angled effort was well saved by Burge before the rebound cannoned back to him. The Welshman squared the ball to his countryman Evans but as the ball rolled across goal Evans could only divert the ball wide at the back stick. Town were rocked by an injury blow to centre-half Eastham who had to go off in the 51st minute, Bolger thrown back into the mix. But the disruption did not dent Town's quest for an early goal, Marney on hand to net his first for the club. The central midfielder had been restored to the line-up after an injury hit start to life at Highbury and capped a fine performance with that goal, blasting the ball home from an angle. Fleetwood went for a second with Evans and Marney twice combining to nearly double the lead. Marney's neat chip into the box released the forward but he was thwarted at the near post with Burge then well saving Evans' header from Marney's subsequent set-piece. Barton made another change, throwing on Ross Wallace for McAleny. And the goals soon flowed. Wes Burns finally got his goal. The attacker was released by Madden and sprinted through on goal, calmly firing the ball through Burge's legs. It was a deserved goal for the wing wizard and another of Town's Welshmen also got the goal his performance deserved. Evans found space on the edge of the box to fire home his first goal from open play since the 2-1 win over Bradford in September to move on to seven for the season. But Coventry kept battling away with Jonson Clarke-Harris ruled to have been clipped by Husband in the box. The referee pointed to the spot but Chaplin fired way over the bar. Though they did not give up Cairns forced into another fine stop tipping Tom Davies' header round the his left post. Fleetwood: Cairns, Coyle, Eastham (Bolger, 51), Morgan, Husband, Burns, J Wallace (Holt, 78), Marney, McAleny (R Wallace, 68) Evans, Madden. Subs not used: P Jones, Hunter, Sheron, Garner. Coventry: Burge, Grimmer, Willis (Davies, 63), Doyle, Chaplin (Bakayoko 82), Hiwula (Andreu, 69) Brown, Hyam, Clarke-Harris, Bayliss, Thomas. Subs: Addai, Mason, Kelly, Ogogo.